In 2008, my now former wife began having medical issues with what is called a Cerebral Spinal Fluid (or CSF) Leak. 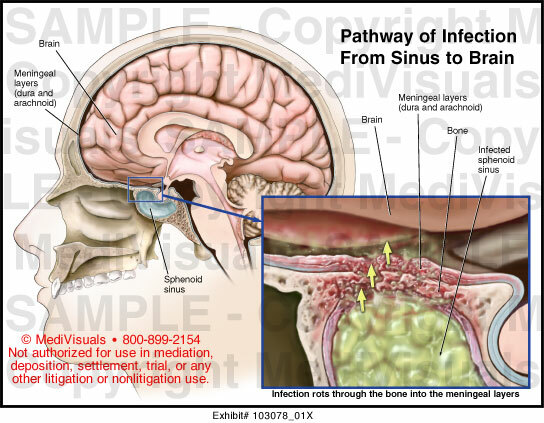 Her condition was the result of a deteriorating bone that separates the sphenoid sinus cavity from the brain itself (see diagram below). The collapse of this bone allowed spinal fluid to seep into her sinuses and then out of her nose. Eventually, she would have to undergo multiple brain surgeries in an attempt to correct this problem. She spent almost one month in the hospital---ten of those days in the neurological ICU. She would eventually recover enough from her medical ordeal to lead a fairly normal life. Unfortunately, the toll it took on our marriage turned out to be too much. My ex-wife is a nurse, and at the time, she was also the Regional Director for Human Resources at a major hospital. The way she chose to deal with the aftermath of her illness created some ugly trust issues that would end up being one of the many reasons why our marriage failed. Several months after our split, I was kicked a second time by an organization that you would least expect. In January 2011, a letter with no return address was left under the welcome mat at my apartment. The letter was from the church I was a member of at the time, although I had not attended for several months. I was being ordered to appear before a Judicial Commission to answer to charges of immoral behavior, abandoning my wife, and pursuing unlawful divorce. I was very hurt and outraged. Not only did I not meet with the Commission, but I also withdrew my membership and warned that any further letters of disciplinary action to me would be regarded as an act of harassment. I added that I was nothing short of appalled at all of them. Had I not withdrawn my membership, then I would have been excommunicated for what they called contumacy (refusal to cooperate with the judicial body). I wasn’t about to give them the pleasure. By the way, the denomination that did this to me was the Presbyterian Church of America (or PCA). I learned the hard way that they have their own judicial system. They are the more conservative of the two branches of the Presbyterian Church, the other being the PCUSA. My ex-wife was not aware of any of this until a few years later after I had left North Carolina and mentioned it to her in an email. She was mortified. It’s obvious as I look back on the ordeal that I was targeted in some way. Ironically, this entire process was intended to bring healing and reconciliation, but it did nothing of the sort. It felt much more like an act of revenge. I never stopped wondering who specifically instigated this ridiculous process against me by the PCA. Of all the people I suspected, everything seemed to point to my ex-wife’s colleagues in the Human Resources Department at the hospital where she is still employed, but today in a different job. I submitted a detailed report to the Employee Relations Department of the hospital because I wanted some answers as to who was possibly involved. During one of the first follow-ups on my case, I was told that some senior officials were looking into it. My next inquiry was met with a much different response. When I called the hospital, I gave the person I was initially speaking with the case number. I wanted to learn why I was all of sudden not allowed to follow up on my own case. I was put on hold for what felt like an eternity. Finally, the VP of Human Resources for the hospital answered and claimed that she had nothing more to say. All of a sudden, my case no longer existed. “There is no case,” to quote her. She then abruptly ended the call. I’ve now been officially prohibited from calling or emailing anybody else associated with the hospital. Needless to say, my suspicions were raised even further. A number of things will prevent me from being able to learn what really happened. Today, I’m flat broke, so I have no money for an attorney’s help or anything else for that matter. I’m also guessing the statute of limitations has expired for a case like this. Too much time has passed. I’m now living with my Dad and being his caregiver, and I recently filed for Chapter 7 bankruptcy. I currently have no job outside of the house or a vehicle that I actually own. I drive one of my Dad’s trucks. I think it’s fair to say that if I’m not at rock bottom right now, then I’m damn close. I just wanted to share this and see what kind of feedback and thoughts any of you want to share. If not, then just move on to the next story. Thank you. How has the church action affected your inability to get a job? Put another way: What is preventing you from getting a job? The church ceased to harass you, did it not? You received one letter from them in January 2011 asking you to answer to charges of violations of the church's laws, but you were still able to proceed with your divorce and you are not a member of that church any longer. Why are you still brooding about that letter? Seems to me when you joined that church, you probably agreed to abide by its laws. How can you fault the church, then, for pursuing your violations of their laws? However, even if you had been found guilty, you could hardly be locked up by the church. That letter appeared on your doorstop over seven years ago. You did not post here about a campaign by the church of unrelenting harassment and threats. Who cares that unknown people think you're the bad guy and your wife was left high and dry? After all these years, do you really imagine people still reflect on you and your wife's divorce? Put this behind you and move on. Counseling may help you get past it, but it does not sound like a lawsuit to me. So my summary of it is that you got exactly one letter 7 years ago allegedly from the church asking that you answer charges that you violated church rules and got so outraged by that that you quit the church and have heard nothing from the church since and you are still outraged by it to this day and can't let it go. That is not at all helpful to you. You need to get over this. It is certainly not harassment for the church to have sent you that letter and there are much more serious things that can befall you than a church letter asking you to respond to an inquiry. You don’t know who prompted the church to open that inquiry and there is no legal mechanism available to you to find out who it was. And really, what does it matter who it was? You have no recourse against that person anyway and even if you did the statute of limitations to pursue it would be expired anyway. You alone control how you feel about this. Don’t obsess about this and make yourself miserable over it. The best thing you can do about this now is forget it and move on to more positive things in your life. Of all the people I suspected, everything seemed to point to my ex-wife’s colleagues in the Human Resources Department at the hospital where she is still employed, but today in a different job. I submitted a detailed report to the Employee Relations Department of the hospital because I wanted some answers as to who was possibly involved. Finally, the VP of Human Resources for the hospital answered and claimed that she had nothing more to say. All of a sudden, my case no longer existed. “There is no case,” to quote her. Hardly surprising. I'm sure these folks had real work to do. It's not their job to investigate what your ex-wife's colleagues may or may not have done outside of the work environment. Today, I’m flat broke, so I have no money for an attorney’s help or anything else for that matter. An attorney's help for what purpose? I’m also guessing the statute of limitations has expired for a case like this. A case like what? What sort of "case" do you think you have or had and against whom do you think you have/had it? As far as I can tell, your post doesn't raise any legal issues. There's nothing wrong with your ex-wife telling her work colleagues that you and she got or were getting divorced (or sharing any other aspect of her personal life). If those colleagues happen to be connected with a church, then the church also became aware of the situation and was entitled to take action to excommunicate you. Nothing illegal or unlawful about that. The church may establish its own rules and enforce them as they choose. It goes back to the whole separation of church and state. Lots of religious rules prohibit practices that are entirely legal from a secular point of view. If your beliefs don't align with those of your chosen church, you find a new church or at least leave the old one. No law is going to prohibit them from enforcing their beliefs on a willing congregant. You don't have a case against anyone from the hospital, or the hospital itself. It is not clear why you think the hospital should care whether an employee of theirs did report something to her church. It has absolutely nothing to do with her job, happened years ago, and was entirely legal. You also have nothing but a suspicion this person even shared anything with the church. It couldn't have been a surprise that your church found out you and your wife were divorcing. It is public record that you filed for divorce and they would no longer see you both together at services. Seriously, you don't need a lawyer but you do need counseling. I strongly advise you to make an appointment with a mental health professional. Stat. My time at that church ended after they tried to summons me. Once I learned about their archaic practices, I left immediately. Some people may agree with that kind of disciplinary procedure, but I never will. It was flat out unacceptable to cross that kind of a line and meddle in places they have no business poking their damn nose. There are much more productive and constructive ways to resolve problems among church members (or members of any group) than to use some damned judicial process. There are a number of church organizations that use a judicial process to sort out violations of church rules as a way to give their members due process before kicking them out. The Catholic Church and Mormon churches come to mind in that regard. It is not that unsusual nor, IMO, is such a process some kind of affront or insult to the member involved. Would you rather that some church official have the power to kick you out without even giving you a chance to respond and make your case that the allegations are unfounded? In any event, you took the option to leave the church on your own and that ended the matter. The church can’t do anything to you besides kicking you out anyway, so you seem to be making a lot out of something that has been over and done with since 2011. You got exactly one letter, you resigned, and the church hasn’t contacted you since. It was over back in 2011. So why are you torturing yourself over this by continuing to dwell on it? It isn't your church anymore, it wasn't even really the church you wanted to join in the first place — you only did it for your ex-wife anyway. So why still focus on this? It isn’t doing you any good to keep coming back to what happened 7 years ago. There is nothing you can do to anyone who reported it to the church, to your ex-wife, or the church itself over simply getting one letter from the church. You have a made a mountain out of a molehill and are letting the mountain you created stand in your way of getting past this. Don’t do that to yourself. Get over it and move on. Life is too short to let minor slights affect you for years. If you can't get over this by yourself, see a counselor or mental health professional for the help to get through it. There is nothing wrong with seeking that kind of help when you need it. We all can use help with something at some point in our lives. So, would anybody else enjoy taking a shot at me? I don't see anyone here “taking shots” at you. We are trying to help by pointing out what we see. We have no stake in your situation and thus can be objective in giving you feedback. And the main thing we are telling you is that the misery you are experiencing over this is of your own making and that you ought to figure out how to get past this and keep it from upsetting your life, with professional help if you can’t do it alone. You have made a big deal out of something that most people would not. Your life will be better if you can just put this behind you and move on. Maybe now I can finally put it to rest. I wish you the best in doing that. Your life will be better once you can get over the past and move on to focus instead of the future. You cannot change the past, so try instead to focus on the things you can do now that can bring you happiness.